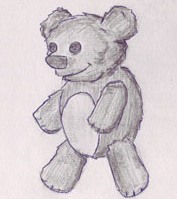 This is Mr. Cotton-Belly, Bolanus' teddy bear (or so I've decided). It was sent by J Horsley III as payment for things we will not be talking about here. It involves a duck that I want back.